Today we cover a new startup MomentVille. If you are planning for a wedding then you might want to look at this site. Founded by Geoff Evason, MomentVille is a free, stylish, and easy to use personal wedding website builder. It's main aim is to help people share, plan, and remember life’s special moments. I was looking to build a wedding website. I was unable to find one that was free, fun, and easy to use. I also disliked the fact that most wedding websites charge excessive prices simply because there is a wedding!. So the core team built MomentVille from the ground up making sure it was free, easy and fun! Let us learn bit more about Geoff, his journey as being an entrepreneur and changing landscape of innovation in Australia. Geoff has experience in a range of companies including startups, and medium and large companies. Geoff’s major interest is in using technology to help make life better. He believes that technology should just work, should be easy to use, should save you time, should make things easier, and should help you enjoy your life more. From concept to launch took 8 months. Users can quickly and easily build their own wedding website on MomentVille.com. A website can be created in under 1 minute. Personalizing a website is a breeze. Users can edit text in place just by clicking on it, drag and drop elements around the page, and change themes instantly. MomentVille is the easiest to use personal website builder. • What market segment verticals you are targeting for? Recently engaged or married couples are the target market at present. • What type of customers you are targeting and many people are using your services? In just over 6 months MomentVille has over 7000 registered users and websites. The primary marketing is through google adwords and facebook ads. MomentVille.com offers both premium and free wedding websites. Free websites are ad supported. Premium websites have extra features and are available for a 1 time cost. There are several existing online wedding website builders. The biggest of these is ewedding.com. Other popular wedding website builders include weddingwindow.com and wedorama.com. • What is unique about your venture? MomentVille is the best wedding website builder around. There are 4 key distinctions that make it stronger than any existing competitors. It Never Expires: Your memories will last forever, so should your website. It’s Green: MomentVille embraces the view that the world should be left healthy for future generations and hence operates carbon neutral websites. It’s the Easiest To Use: There is no comparison to other wedding websites. 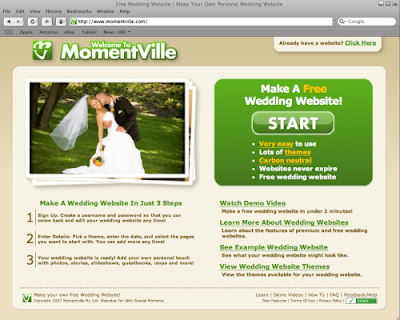 MomentVille is the only wedding website to embrace web 2.0 principles, AJAX, and 3rd party widgets. There is virtually no limit to what users can do on MomentVille. The website was built using Ruby On Rails and uses a lot of AJAX. The web platform Ruby On Rails sped up development drastically. Open source tools are used almost exclusively. These include Linux, MySQL, and Ruby on Rails. MomentVille.com runs on linux and uses Ruby On Rails and MySQL. There is a regular (monthly) Ruby On Rails meet up in Sydney. We are constantly on the lookout for a similar meet up for entrepreneurs. Having lived in various countries I don’t believe that starting a venture in Australia is any harder than other western countries. It takes vision, determination and hard work. All cities in Australia are vibrant, but I highly regard Sydney’s resources, hi tech community, and excellent work-life balance. I think the geographic isolation is continually becoming less of a roadblock as online technology makes starting a business from anywhere easier. I cannot comment on this as I was schooled in North America. More grants and tax incentives and an easier to navigate grant system would further improve innovation. I think the 3 main issues that ought to be discussed are climate, education, and infrastructure. Climate is important for obvious reasons. Australians both young and old need to continue learn and adapt to a fast-paced economy; learning how to pass tests is insufficient. Finally, Australia must embrace and drive innovation, especially in technology infrastructure, to establish itself as a leader in the world. Work hard. Work smart. Don’t give up. Seek help and advice. Use the product/service you are offering. Release early and constantly try to improve your product and your processes. Thanks Geoff for sharing your thoughts. We look forward to hear from you in future on the progress of Momentville. All the best for Momentville.